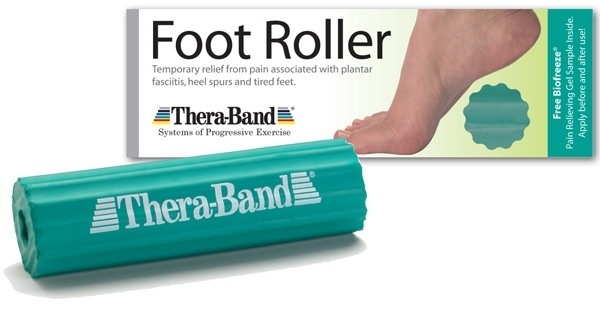 Do you have a heel spur or is it plantar fasciitis? Without a doubt this is one of the most common conditions I treat in the office. It effects not only runners, but even more so the general population who may not even exercise. What exactly is it? Heel pain is more correctly referred to as plantar fasciitis but still tends to have the slang “heel spurs” associated with it. This is because 50-60 years ago, the medical community thought the pain was the result of the spur which could sometimes be seen on radiographs. We have since figured out that this dreaded heel pain is due to an overuse type of phenomenon where the plantar fascia and other intrinsic muscles that arise on the heel become inflamed. Below is a typical example of a patient recently seen in my office with heel pain. She is suffering from plantar fasciitis despite the common misconception that she has a heel spur. Surprisingly she does have a spur on X-ray! This however is not the cause of her pain. Her pain is only on the right side and has been present for about 6 weeks. Examining the radiographs of both feet reveals that both feet have a heel spur. Classic proof that the spur is not the cause as she has no pain on the left heel. No to mention we know that a spur takes much longer to develop than 6 weeks which is how long she has been complaining of pain. The bony spur to her heel has probably been present for many years. And, we will see her pain resolve without removing the spur. So the next time you blame a “spur” for heel pain, think again! It’s probably a subtle increase in activity or that new pair of shoes you wore out that precipitated it! Don’t blame a “spur”! For more information on a new study discussing treatment options for plantar fasciitis, see this post. Spur is present with NO pain. Spur is present WITH pain. High-heeled shoes may look good, but they’re bad for your feet. Good shoes must accept online real play. i am a lupus patient (21 years). i have problems with both heel having developed spur. there are times i experience pain while walking. even when i am resting there is “spasm” in my heel. i have stopped my walking exercises. i was told by my lupus doctor to wear slightly elevated foot wear. strange, but sometimes the pain just disappears. would appreciate your advise.